The S-8800 High Performance AM/FM Radio is the latest radio to be released by Tecsun, and we think it has been worth the wait. The Tecsun S-8800 High Performance AM/FM Radio has been designed to provide maximum performance on the AM (MW) bands, allowing listeners to receive fringe AM radio stations with unmatched audio clarity. Being the authorised distributor for Australia and the Pacific, we obtained a handmade sample for evaluation and gave it to our radio expert Garry Cratt (VK2YBX) for evaluation. Read on for Garry’s review. Like many other models, the unit is battery operated, but in this case the batteries are 2 x 18650 lithium cells, which are charged via the USB socket on the side of the receiver. This ensures adequate DC power to sustain long periods of listening at good audio level. Users may recall that both the Tecsun BCL-3000 and the Tecsun S2000 use expensive C or D cells, and obviously customer feedback has led to this change to lithium cells. The receiver even has a built in battery tester, in the form of two LEDs recessed into the battery compartment. If the LED does not illuminate, replace and recharge the offending cell. There is also a battery indicator as part of the front panel LDC display. The second most obvious new feature of the Tecsun S-8800 is the inclusion of an infrared remote control. No other Tecsun model has this feature which allows the receiver to be controlled without having to touch it. This is an advantage when receiving AM stations , where the receiver has been physically oriented for best reception. All the Tecsun S-8800’s features can be controlled using the remote control, including power, display (changing between frequency or time), memory (store or recall frequencies), tuning, VF/VM modes, scanning, mode (AM, FM (mono or stereo) USB or LSB, bands (AM, FM or shortwave, 9/10kHz setting for MW, AM bandwidth, and a keypad to allow direct entry of frequencies. Fortunately, or perhaps part of the good overall design, the remote control operates from regular AAA batteries. Some of the receivers I have tested use special button batteries that are expensive to replace. Ever since the demise of the Tecsun BCL-3000, and prior to that the Tecsun BCL-2000, there has been a need for a receiver capable of providing good fringe reception of AM broadcast band signals. Other desirable features that go hand in hand with good AM sensitivity are frequency stability and those features which affect the tonal quality of sound. The Tecsun S-8800 fills this requirement by having separate volume, bass, treble and bandwidth controls. It also has the advantage of a 120mm speaker rated at two watts output, which provides superior sound, even when compared to the Tecsun PL-880 portable which has been used by many as a benchmark. The Tecsun S-8800 has provision for the connection of an external AM antenna via the commonly encountered push button “speaker connectors”. This is a high impedance connection, so you can connect your longwire antenna directly. However, most listeners will appreciate that an external antenna, which includes a matching balun and fed with shielded coaxial cable helps eliminate the effect of interference caused by many household items. The low impedance external BNC antenna connections can also be used for shortwave reception. One great feature that has been included is AM bandwidth selection. 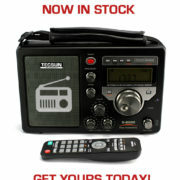 The only other model Tecsun receiver with this feature is the Tecsun PL-310ET, and it makes a world of difference. When an AM signal is noisy, being able to adjust the bandwidth from 6kHz down to 3 or even 2.3kHz means the difference between annoying noise and an intelligible signal, even if it does mean some loss in fidelity. This is of no consequence when most of the programming is “talkback”. Although the frequency range is stated as 520-1620kHz (when the receiver is set to 9kHz spacing), it can be extended by setting the receiver to 10kHz spacing and then it will be possible to tune 520-1710kHz. By using slow tuning steps (1kHz), and station can be tuned. Like previous Tecsun models the S-8800 allows the user to select between 64-108MHz, 76-108MHz and 88-108MHz frequency coverage. There is also provision for connection to an external FM antenna, and many users already know the trick of connection to their household TV antenna to improve reception. Forcing the receiver into the FM mono mode will also improve weak signals. SSB (single sideband) is used by what shortwave listeners call “utility” services. This can include amateur radio operators, aircraft, marine weather, 4WD clubs, The Flying Doctor (in Australia), as well as being used by mining camps, police etc for regular outback communications. The Tecsun S-8800 allows independent selection of USB or LSB, and facilitates either 1kHz or 10Hz tuning steps in this mode. The receiver covers 100-519kHz (LW), 520-1710kHz (AM using 10kHz channel spacing), 1711-29999kHz (SW). There are a myriad of other features offered by the Tecsun S-8800 including those found in most models such as clock, timer, snooze and alarms. In total 650 stations can be stored in memory across all bands (there are limits for each band) and recalled in real time or at some time in the future. There are also the usual store, recall and delete memory functions as well as auto sort (handy for removing duplicate frequencies. The receiver offers frequency “browsing”, similar to the ETM function found on smaller portables like the Tecsun PL-310ET and Tecsun PL-365, as well as semi-automatic storage (the receiver stops when it finds a signal and you have 4 seconds to store it), and ATS (Auto Tuning Storage) where the receiver stores every signal it discovers. It is these operations where the use of the remote control makes the process much easier. Like all computer driven receivers, things do sometimes get confused between operator and machine. To remedy this, there is a reset switch hidden under the main tuning knob. Pulling the knob off the shaft reveals this. A small pointed device is required, most uses find a paper clip is suitable. Testing so far has centred around fringe AM reception. My test site is 200Km from Sydney and I have found 2UE (954kHz) to be the weakest Sydney station. They transmit 5kW using an omnidirectional antenna. For the test I decided to compare the Tecsun PL-660, Tecsun PL-880, Tecsun S2000 and Tecsun S-8800. Each receiver was placed in the same position on a test bench, located in an open area, and operating from batteries. Using the 954kHz reference frequency, I compared all receivers. The Tecsun S-8800 performed better than all the others. I was very surprised that it performed better than the Tecsun S2000 which has a much larger ferrite rod antenna. Tecsun PL-880 results: noisy but intelligible (using reduced bandwidth). Further testing on all bands will be performed in coming weeks and the results added to this review. The Tecsun S-8800 is due to arrive at the Tecsun Radios Australia Sydney warehouse in mid-March (date TBC) with an initial batch of 20. It is available to pre-order now on the Tecsun website – eleven have sold already, so get in quick for the best chance of securing yours! Well spotted, we didn’t catch that previously. We’ll endeavor to be double check the frequency in the next video.